With an oncoming car that erroneously turned in front of us at an intersection, and a few panic-filled seconds of stomping on brakes and bracing for impact, we ended up in a relatively low-impact head-on collision where no one was seriously injured. It occurred to me later that a huge portion of today’s cars are designed around mitigating damage from accidents. Everything from seatbelts, to airbags, child car seats, headrests, bumpers, and headlights are all designed to improve safety and reduce the cost and liability of car accidents. As a point of comparison, we don’t plan for accidents on elevators and escalators. There are no seat belts on elevators. The logical next question is, how much of this goes away as we enter into the driverless car era? Yes, it’ll be a messy transition period, and we will only see a relatively small amount of change while there are still human drivers on the roads. But once we develop fully automated transportation systems, will we still need all these safety features? Throughout this column I will be making a number of predictions about the coming driverless era, which will be followed by the age of fully autonomous vehicles. Naturally this will require a level of trust in the technology that is still a ways off. However, the economic drivers behind rapid adoption are hard to ignore. As with all predictions, there are a number of variables that could cause a far different outcome. For this reason, the true value of a prediction is in drawing your attention to the situation, and you reaching your own conclusions. I’ve been doing some math on driverless cars and came to the startling conclusion that autonomous cars will wear out in as little as 9-10 months. Yes, car speeds will be slower in the beginning, but within ten years as speeds increase and cars begin to average 60-70 mph on open freeways, a single car could easily average 1,000 miles a day. Over a 10-month period, a single car could travel as much as 300,000 miles. Cars today are only in use 4% of the day, less than an hour a day. An electric autonomous vehicle could be operating as much as 20 hours a day or 21 times as much as the average car today. For an electric autonomous vehicle operating 24/7, that still leaves plenty of time for recharging, cleaning, and maintenance. It’s too early to know what the actual life expectancy of these vehicles will be, but it’s a pretty safe assumption that it will be far less than the 11.5 years cars are averaging today. 2028-2030 will be the years of peak messiness for the driverless car revolution. The number of autonomous vehicles will grow quickly but they will be intermingled with traditional driver-cars. Drivers bring with them a hard-to-quantify human variable, and that’s what makes driving today such problem-riddled experience. There are roughly 258 million registered cars in the U.S. and replacing them will be a long drawn out process. But here’s what most people don’t understand. One autonomous vehicle that we can be summoned from a local fleet will replace 30 traditional cars. During off-peak times, 30,000 autonomous vehicles will handle virtually all other transportation needs. Peak traffic times that will be the hardest to manage. 3. Less than 4 million autonomous cars will replace 50% of all commuter traffic in the U.S.
With roughly 250 million people in the U.S. living in urban communities, 3.75 million autonomous vehicles will handle 50% of peak commuter traffic in the country. That means 4 million autonomous vehicles will replace our need for half of all cars, or roughly 129 million vehicles. With a projected sale of 17-18 million new vehicles annually in the U.S., a fleet of even 1 million autonomous vehicles will make a serious dent in traditional car sales. The thinking of large fleet owners will dominate the autonomous car market. Their focus will be on vehicle costs, repair records, maintenance, cleaning expenses, and operational efficiencies. In a competitive consumer marketplace they will also have to pay close attention to comfort, convenience, and the overall user experience. AI-driven fleet management systems will be tasked with ensuring cars are in the right place at the right time to meet user demand. This type of fleet management software will take years of operational know-how to make it work efficiently. As battery life improves and recharging stations become more automated, the demand for electric vehicles will jump exponentially. However, large fleet owners will only choose electric cars if they are easier to maintain, more reliable, and cost efficient. Battery range for electric vehicles is improving. Even though Elon Musk has predicted a 600-mile range for Tesla cars in 2017, their latest models only get about half of that. So far the primary drivers for extending electric vehicle distance has been a form of “range anxiety” among individual consumers. Once autonomous vehicles come into play, the need for far greater distances will be driven by fleet owners who will view “range” as a primary purchase consideration. For this reason, we will see electric vehicles routinely passing 1,000 miles on a single charge within ten years. Since 76% of cars on the road only have one person in them, and since one-person vehicles will be cheaper, over 80% of autonomous fleets will be designed around single passenger occupancy. Roughly 40% of state and local sales tax comes from auto sales. With the current rules all cars in a fleet will be exempt from sales tax. Very likely new taxes will be created to replace these lost revenues. Over 10% of today’s retail businesses are connected with cars. As personal ownership of cars begins to shrink, we will see a rapid decline in gas stations, car washes, oil change businesses, detail shops, tire shops, brake shops, emissions testing, alignment shops, auto repair, body shops, tow trucks, glass repair, transmission repair, auto part stores, rental car agencies, and auto insurance offices. Dealerships themselves will also disappear. In most U.S. cities, 80% of police departments are dedicated to traffic control. Without DUI fines, speeding tickets, and parking fees, most police departments will be trimmed to a bare minimum. In 2014, federal fuel taxes amounted to $35.2 billion. This number will undoubtedly increase over the coming years until we reach a point of peak gas usage somewhere in the mid-late 2020s. The big apple collected a whopping $1.9 billion from traffic violations in 2015, and this number has been steadily increasing over time. According to the Airports Council International-North America, 41% of airport revenue in the U.S. comes from parking and ground transportation services. Virtually all of this will disappear over the coming years. When we combine the loss of sales tax, retail stores, income from traffic violations, gas tax, vehicle licensing, parking meters, and parking garages, the total loss of revenue to a city becomes a very large number. Keep in mind, what I’m referring to is their current revenue streams. They will undoubtedly develop new ones but that will require considerable foresight and planning. The National Safety Council estimates 38,300 people were killed and 4.4 million injured on U.S. roads in 2015. Driverless cars have the potential to push those numbers nearly to zero. If we consider how low the accident/injury rate is for the airline industry, that’s roughly what we should expect for autonomous vehicles. That’s over half a trillion dollars, in the U.S. alone, that simply goes away. In 2015, 707,758 motor vehicles were reported stolen. Of that total, 24% were stolen in California, and over 14% were Hondas. According to KPMG, accidents will decline 80% by 2040 due to safer cars and autonomous transportation. But if driverless adoption happens sooner, the 80% decline will come into play much earlier. While the cost per accident may rise substantially because new cars and their parts are more expensive, once driverless tech hits it’s stride, the decline will be dramatic and result in sizable reductions in loss and premiums. More than 90% of accidents each year are caused by driver error. In the past, being in business was all about “location, location, location.” However, as the driverless world evolves, passengers will become much more involved in working, watching movies, and playing games throughout the commute. As a driver, we become very invested in the landmarks along the way, and understanding the context of our location. But once drivers transition to passengers, they will be paying far less attention to local landmarks. As a result, it will be far easier to just ask your car to take you to whatever store or business you want to go to, regardless of proximity to your current location. Perhaps a better way of thinking about this is that location will still matter, but it will matter differently. As car ownership declines, garages will no longer be needed as a place to park your car. A nicely remodeled garage, set up as a separate living unit, could add as much as $1,500-$2,000 a month in rent payments, as an AirBNB rental, to the average homeowner’s income. 14% of Los Angeles is currently used for parking. We have an amazing amount of land dedicated to parking – over 5 million acres to be precise. Demand for parking will begin to dwindle over the coming decades and this property will be sold as prime real estate for redevelopment. According to AAA 2015 study, the average person spends $8,698 a year on their car that averages 15,000 miles per year. That works out to $725 a month. For autonomous vehicles, projected annual spending on transportation will be far less – $4,200 (.28/mile * 15,000 miles) or $350/month. As dealerships and gas stations begin to dwindle, the overall cost of owning and maintaining a car will begin to ratchet upwards. Once autonomous vehicles reach 50% of commuter traffic, the cost of traditional car ownership will skyrocket. One thing that symbolizes overcrowding more than anything else is traffic. Once traffic flows smoothly, people will begin to regain control of their lives and our sense of feeling overcrowded will begin to disappear. Over the next 2-3 decades, driverless technologies will be either directly or indirectly responsible for the loss of 25% of all of today’s jobs. Job losses will be offset by job creation. Businesses that disappear will be replaced by innovative new businesses built around the ingenious new capabilities autonomous vehicles provide. In the future, our cars will know far more about us than we know about them. 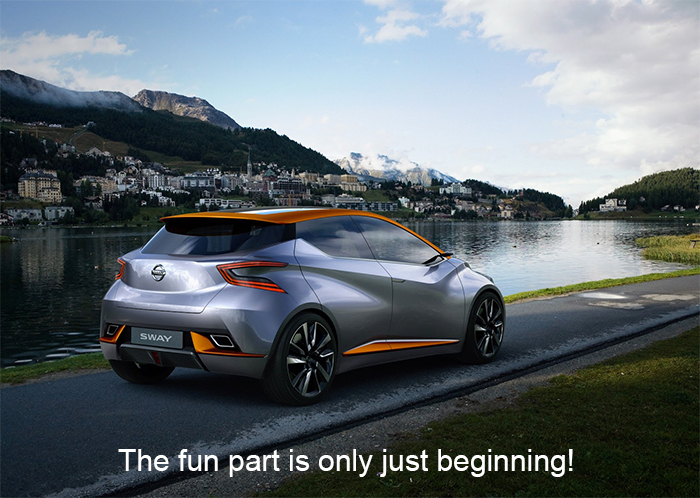 Each new vehicle will instantly know how to adjust the seats, what music we like, our favorite TV shows and where we left off in the latest series. It will also understand where we’re going, letting those we’re meeting with know when we will arrive. As transportation becomes faster, cheaper, and easier, we will simply do more of it. We’re moving towards a very fluid society, and all this movement will seem natural and effortless. It’s important to understand that driverless technology will not only be applied to cars, but also tractors, trucks, ships, lawnmowers, forklifts, water taxis, snowplows, submarines, drones, trains, and even airplanes. It will soon touch the lives of every person on planet earth.